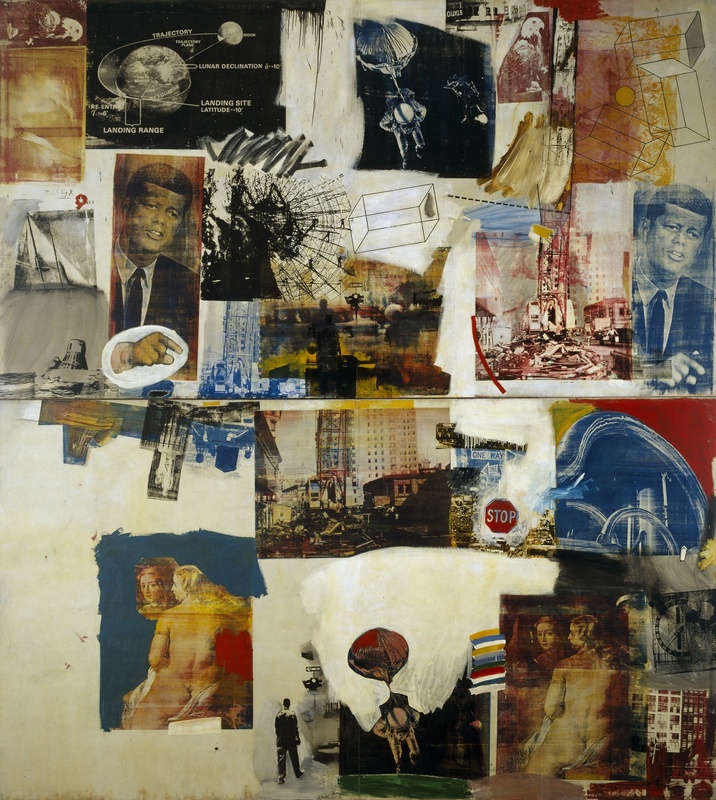 Skyway, 1964 Robert Rauschenberg – Oil and silkscreen on canvas Dallas Museum of Art, The Roberta Coke Camp Fund, The 500, Inc., Mr. and Mrs. Mark Shepherd, Jr., and General Acquisitions Fund © Rauschenberg Estate/Licensed by VAGA, New York, NY. There are many iconic images of the 22nd of November,1963, the day President Kennedy was assassinated in Dallas, Texas. Amid all the poignant pictures the relevance of a small collection of artwork by Picasso, Franz Kline, Thomas Eakins, van Gogh and Charles Marion Russell has become lost. Nearly fifty years on from the tragedy in Dallas, ‘Hotel Texas – An Art Exhibition for the President and Mrs John F. Kennedy’ offers a different perspective on those infamous events. The Kennedy’s three day trip to Texas, an early salvo in the president’s 1964 re-election campaign, had already seen the first couple visit San Antonio and Houston, before they arrived, exhausted, at the Hotel Texas in Fort Worth, in preparation for visits to Dallas and Austin the next day. In their hotel suite the pair were met by a treasure trove of art hanging from the room’s walls and went to bed assuming the pictures to be replicas. On closer inspection, the next morning, they discovered that the artworks were authenticated originals. This unprecedented exhibition was the work of Owen Day, a Texan art critic. Day learned that the seventy-five dollar a night suite reserved for the president was not the most luxurious in the hotel, the ritziest room had instead been reserved for the Texas-born Vice President Lyndon Johnson and his wife Lady Bird. The Johnson’s suite had hand-me-down items from the Ritz Carlton in New York, while the Kennedys had to make do with views of a bus station and some underwhelming furnishings. 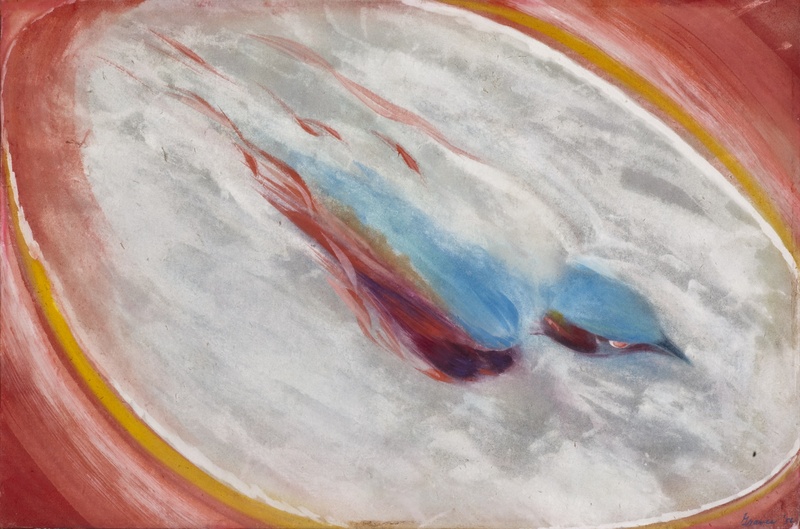 Spirit Bird, c. 1956, Morris Graves, Tempera on paper, Modern Art Museum of Fort Worth, Gift of the William E. Scott Foundation. Knowing the first couple were art lovers, Day began to organise a ‘customised art experience,’ in an attempt to brighten the suite where John and Jackie would, ultimately, spend their last night together. After a flurry of telephone calls it was arranged that the rooms would be decorated with a selection of art and sculpture assembled from the Modern Art Museum of Fort Worth and the Amon Carter Museum of American Art. Private collectors also offered work, all expertly negotiated by Ruth Carter Johnson, a civic force in Fort Worth, who didn’t vote for Kennedy but still wanted to contribute to the effort. President Kennedy spent his last night sleeping beneath van Gogh’s ‘Road with Peasant Shouldering a Spade’, while Jackie slept below ‘Swimming’ by Thomas Eakins. It was supposed to have been the other way around, but the couple changed beds unexpectedly. Traditional American art was represented with the inclusion of Charles Marion Russell’s ‘Lost in a Snowstorm – We Are Friends’, while modernist works, more tailored to Mrs Kennedy’s art tastes than to her husbands, were also featured, such as Franz Kline’s ‘Study for Accent Grave’ and ‘Spirit Bird’ by Morris Graves. There was even a Picasso sculpture, the charming ‘Angry Owl’, which sat in the suite’s entrance hall, running the risk of courting controversy given the artist’s flirtations with Communism. 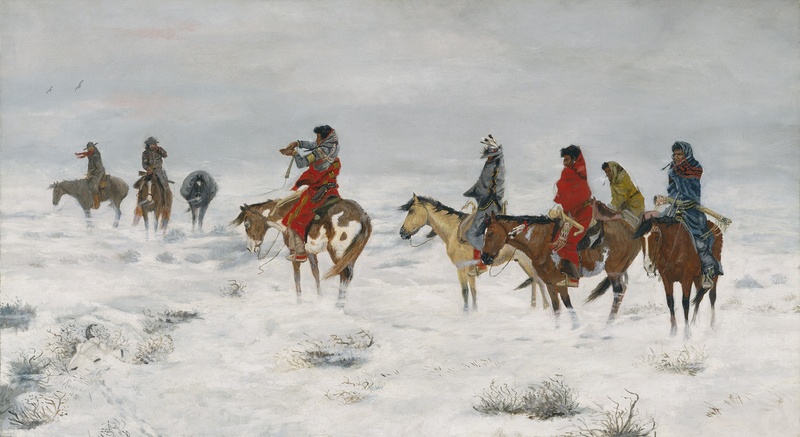 Lost in a Snowstorm – We Are Friends, 1888, Charles M. Russell, Oil on canvas, Amon Carter Museum of American Art, Fort Worth, Texas. Of the twelve artworks displayed in Suite 850, Eakins’s ‘Swimming’, is given the most consideration in the book, which features an essay on the painting by Alexander Nemerov. The picture depicts several swimmers lounging upon an eighteenth century sawmill platform by a newly created lake. The ruined platform remains the same, for now, but the water is slowly eroding it and changing its environment. A new world is coming while another is leaving and the figures swimming seem trapped somewhere between the coming and the going. Nemerov notes that when Father Oscar Huber gave Kennedy Extreme Unction, the Last Rights of the Catholic Church, at Parkland Memorial Hospital after the shooting, his words like Eakins’s painting ‘marked Kennedy’s passage from one world to the next’. Thomas Eakins himself, in a self portrait, breaststrokes in the lower right of the picture, echoing, writes Nemerov, a Professor of Art and Art History at Stanford University, JFK’s famous four hour swim to Plumb Pudding Island, with a severely injured man on his back, after his PT boat was sank by the Japanese during WWII. 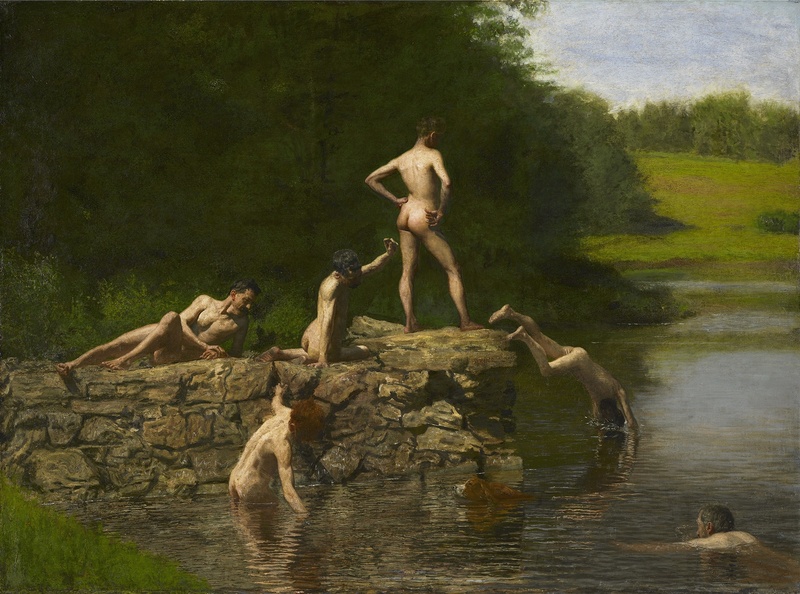 Swimming, 1885, Thomas Eakins, Oil on canvas – Amon Carter Museum, Fort Worth, Texas, Purchased by the Friends of Art, Fort Worth Art Association, 1925; acquired by the Amon Carter Museum, 1990, from the Modern Art Museum of Fort Worth through grants and donations from the Amon G. Carter Foundation, the Sid W. Richardson Foundation, the Anne Burnett and Charles Tandy Foundation, Capital Cities/ABC Foundation, Fort Worth Star-Telegram, The R. D. and Joan Dale Hubbard Foundation and the people of Fort Worth. 1990.19.1. The picture, like the president, is rooted in Catholicism, the figures in the painting with their perfectly sculpted bodies and proud postures are reminiscent of Caravaggio’s religious depictions of martyrs, John the Baptist and David. Yet these characters are simply larking about by the water’s edge, they aren’t saints or apostles, they look like heroes, but they lack a story. Jackie Kennedy loved the display and remarked that she wished she could have stayed longer to admire the pictures, while Jack Kennedy rang Ruth Carter Johnson to thank her for organising the surprise; it was the last phone call he ever made. After breakfast Kennedy was presented with a ten-gallon cowboy hat by the civic leaders of Fort Worth, he refused to try it on, but promised to wear it on his return to the Oval Office. “No, you certainly can’t!” Kennedy answered. A second later, history took its shocking course. 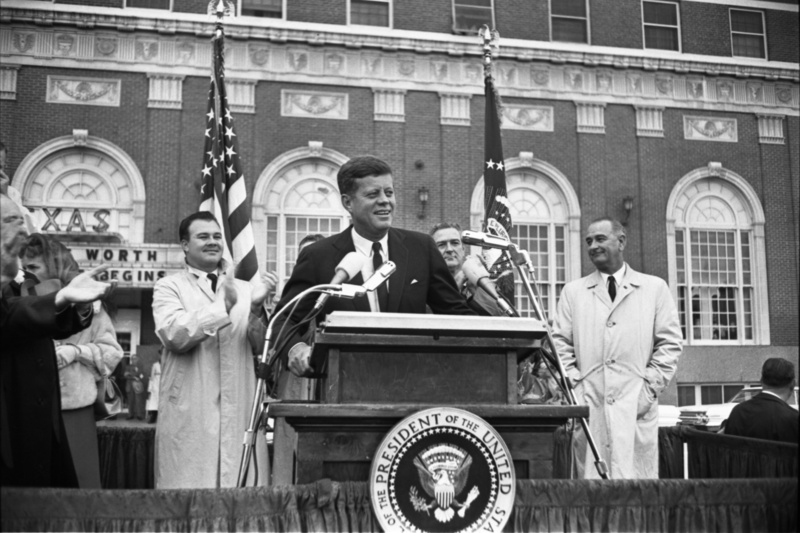 President Kennedy speaks to the crowd outside the Hotel Texas in Fort Worth, Texas, November 22, 1963. William Allen, photographer/Dallas Times Herald Collection – Courtesy of The Sixth Floor Museum at Dealey Plaza. Hotel Texas – An Art Exhibition for the President and Mrs John F. Kennedy is available now from Yale University Press.